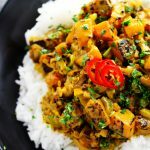 Indian Butternut Squash Curry is a delicious vegetarian squash curry simmered with fragrant spices and rich coconut milk. Confession: I’ve developed a bit of an obsession with meal delivery services. It’s just so much more easy to drive home after work and have a box of groceries waiting for you, rather than going to the grocery store, standing in line, unloading the car, and then cooking. Obviously I LOVE to cook – I don’t, however, have a grocery shopping obsession. I fit the grocery store in when I can, usually heading there on my lunch break and picking up what I need for that night’s dinner. Blue Apron recipes feature seasonal, unique ingredients that are hard to find at your typical grocery store. Most meals can be prepared in 35 minutes or less. My last box arrived with the ingredients to make this amazing Butternut Squash Curry. Perfect for Meatless Monday. This Butternut Squash Curry is definitely a recipe that I will continue to make on my own, even without the help of Blue Apron delivering the ingredients to my front door. I like that the ingredients are easy to find in the local grocery store and the fact that it’s a healthy and quick weeknight dinner option. You can always win me over with a spicy, fragrant dish that’s served over a steaming bowl of rice. Bonus points if you give me a glass of Riesling to sip on the side! This Indian Butternut Squash Curry is a delicious vegetarian squash curry simmered with fragrant spices and rich coconut milk. In a large skillet heat olive oil on medium-high until hot. Add squash and season with salt and pepper. Cook, stirring occasionally, 6 to 8 minutes, or until slightly softened. To the skillet add garlic, ginger and spices. Cook, about 1 minute, until fragrant. Add shallot and celery. Cook, stirring occasionally, 3 to 5 minutes, or until softened. Add the coconut milk to the pan. Reduce the heat to medium and simmer, stirring occasionally, 10 to 12 minutes, or until thickened. (Be careful not to boil, as the coconut milk may separate.) Remove from heat and season with salt and pepper to taste. Serve curry on top of rice, topped with chopped cilantro. 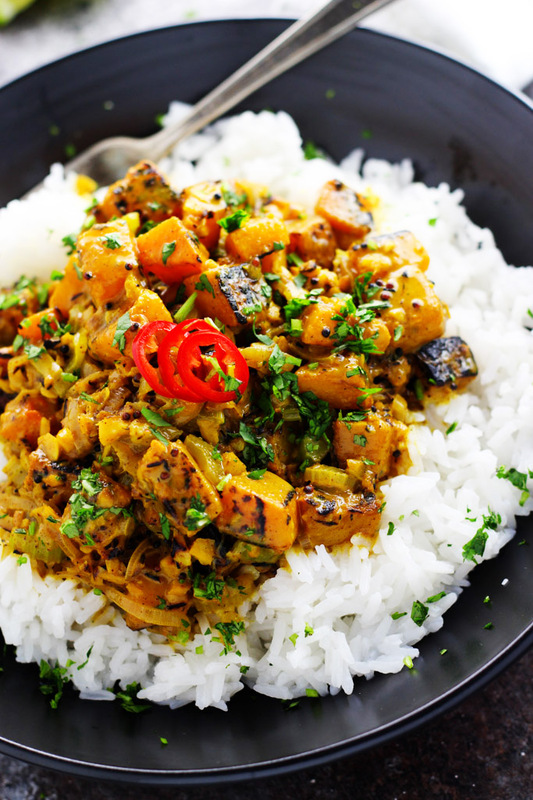 Dry Riesling is a great match for this squash curry. It’s hint of sweetness will tame down the heat while its acidity stands up to the bold blend of spices. Gewurztraminer is another lightly sweet wine that pairs nicely with this dish. This looks so delicious! I love vibrant dishes like this – it makes eating even more enjoyable 🙂 I’ve never tried Blue Apron, but I have tried most of the other services. They’re so helpful during the holidays especially! I agree Marlynn! Plus, the gift of a subscription would be great at holiday time too! 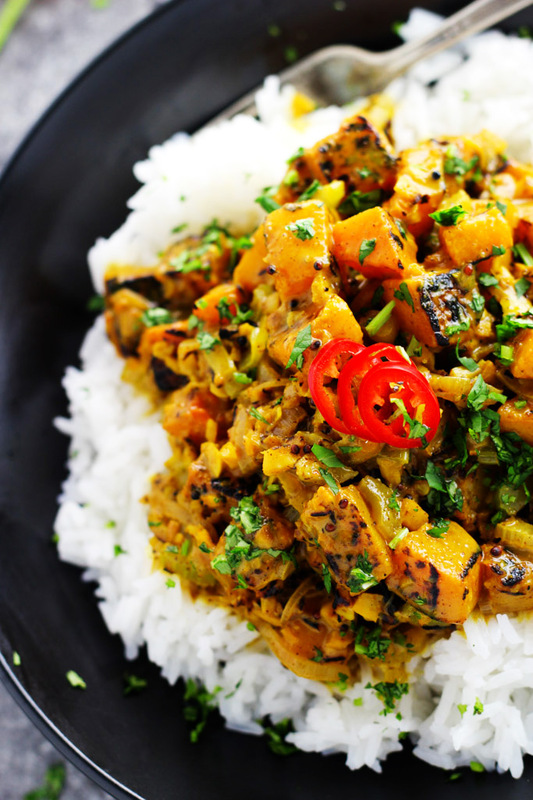 Squash curry sounds so great today since it’s colder and dark and dreary! This is definitely a go-to comfort food on chilly days! I haven’t tried out any of the meal delivery services yet but I have some friends who really love Blue Apron. This looks so scrumptious! I love lively dishes similar to this– it makes eating a lot more pleasurable. We are crazy for butternut squash this time of year, and this looks amazing! We are having Indian food tomorrow, so I will add it too the menu and give it a try. I hope you enjoy Renee! 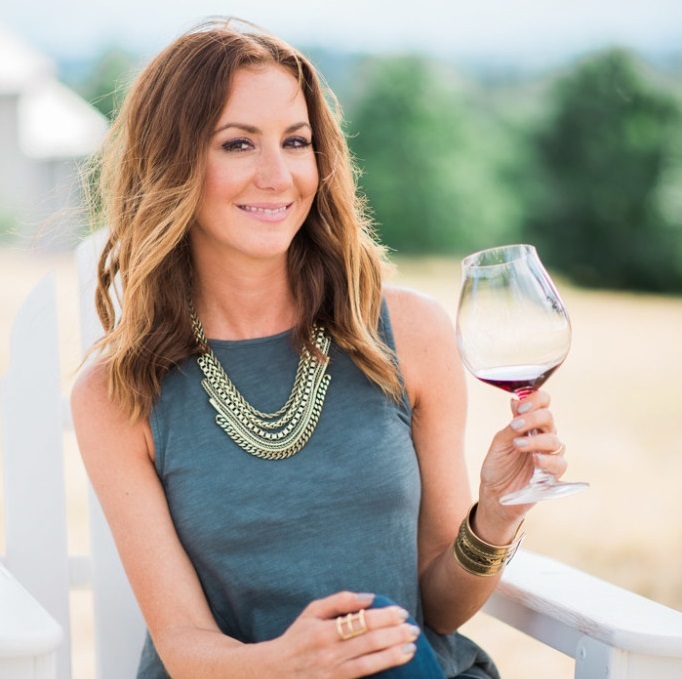 Your tag line says “Can I pour you a glass of wine”. Yes, I’m sure you can; as in you are able. You really should ask, “MAY I pour you a glass of wine”. It was delicious! I will definitely be making it from now on. I’m so happy to hear that you liked this dish Keiko! I made it and it was A M A Z I N G!! So happy to hear that you liked the curry Consuelo! The recipe looks great, but blue apron is a terrible choice for vegetarians. You get three meals of their choice and if you don’t like any of the meals, that’s too bad. I’ll stick to my grocery store. My husband and I agreed that the curry is missing something, we are just not sure what it is! Maybe it’s because we spent ten days in India last month and I’m trying to copy some of the things we ate while there. I thought the texture of the squash (once it softened) made the curry a bit too much like a thick sauce. We ate two helpings with rice, and I pureed the rest. We will consider it a soup.